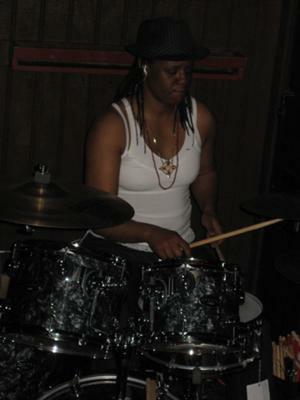 Rochelle Coatney has over 20 years experience as a drummer and percussionist. She was born on June 20th 1972 in Torrance California. She spent the first ten years of her life on world tour as a member of a military family in places like Fort Ord in Monterey CA., The Presidio in San Francisco, CA., and other Army Military installations in Augsburg, Germany; Fort Shafter, Hawaii; Fort Lewis, Washington State; and Fort Huachuca, Arizona. Rochelle’s passion for music is a family legacy. She would spend many hours with her father listening to old school, r&b and the contemporary music of the time. From early childhood, Rochelle demonstrated a talent for percussion tapping or beating anything she could find around the house. It was only natural for her to gravitate to formal training at the earliest opportunity when she joined the pep band at Pius X High School in Downey, CA., under the direction of Jim Drollinger. Rochelle played at every opportunity from freshman to senior year mastering bass to snare drums and then tri-toms (i.e all the football & basketball games as well as numerous recitals. 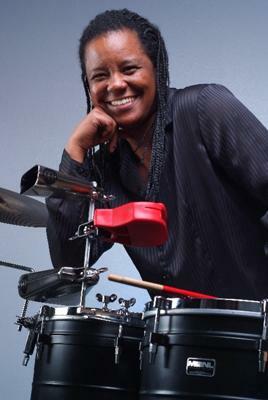 At Cerritos College in the Applied Music Program Rochelle learned drum set under the guidance of Dr. Theresa Dimond. She also took two years in Jazz, Classical, and Rock disciplines during which she played for the community Jazz Band, Gospel Choir, and various ensembles. While at Cerritos College, Rochelle formed a rock band with five classmates and began professional performances outside of school at venues around Los Angeles. Next, Rochelle attended California State University, Dominguez Hills. At the same time, she spent four years with the Anaesthetics, an alternative rock band, contributing to the arrangements for an all-original repertoire and performing at: The Whisky; the Alligator Lounge; and all over Hollywood. She completed two tours to Texas and Oklahoma also performing at a music festival in Mexico featuring Coolio. Soon after leaving the Anaesthetics, Rochelle began playing in Gospel plays for a playwright named Donald Welch completing engagements of four of Donald’s plays at the LA Wilshire Ebel Theater including: “Let The Church Roll On” starring Marla Gibbs and Dorian Wilson, “Heaven Bound”, “Hallelujah Mahalia” & The First Lady of Zion. 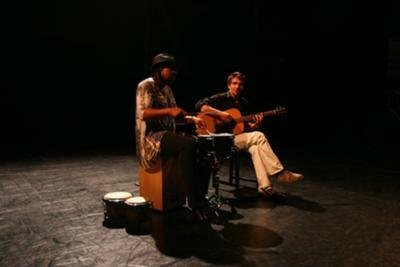 During this time, Rochelle became very interested in Latin music and began to take Timbale lessons from world renowned drummer and percussionist Tiki Pasillas and also Robertito Melendez and has continued to take lessons and study the instrument ever since. Rochelle now plays with a number of different projects: Suezenne Fordham Chamber Jazz Orchestra (Percussion), Sabbath In Black (Drums) Black Sabbath Tribute Band, Grupo Nicoya (Timbales), folkloric Nicaraguan along with other styles of Latin music, and The Jug or Nots, Jug Music from the 1920/30's (wash board, cajon and what ever else we can find). A quick study, she often subs or steps in for short-term gigs because of her ability to pick up or create arrangements for other bands. 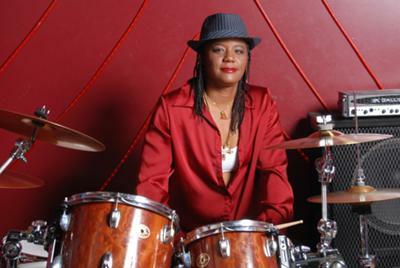 Rochelle Coatney continues to study Drums, Timbales and Congas and she is currently listening to all styles of music. Master Latin Jazz Trumpeter Dr. Bobby Rodriguez (Drums/Timbales). While playing with Dr. Rodriguez Rochelle has had the pleasure of sharing the stage with legends such as Joe Rotundi and Munyungo Jackson.